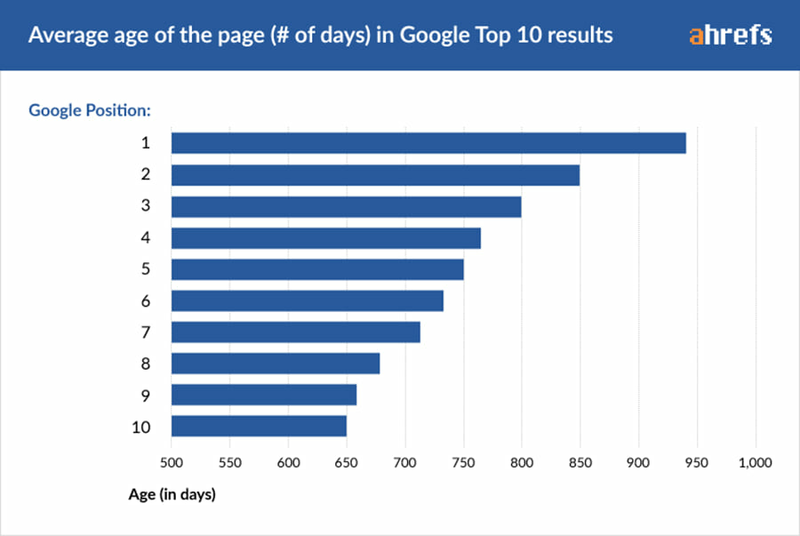 Ahrefs conducted a study on what and how long it takes a web page to become a top-ranking page on Google. They found out that on average most top-ranking pages are over two years old and that generally pages with a high Domain Rating (DR),which shows the overall strength of a website's backlink profile, perform better than pages with a weaker DR. 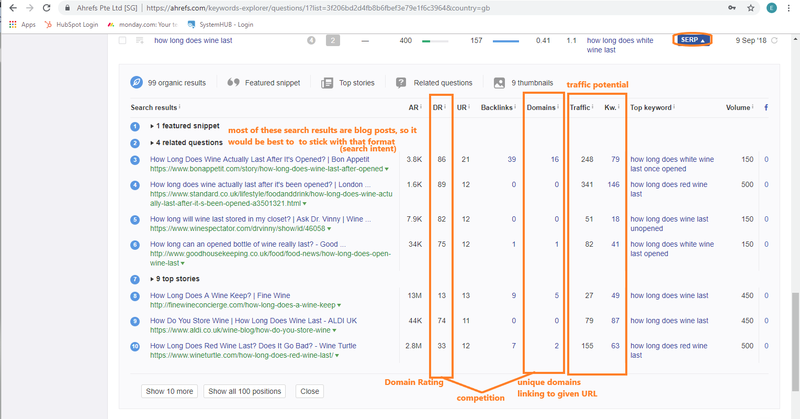 In addition, they also found out that ranking for keyword terms with a lower search volume generally tends to rank faster ,since they have lower competition and that websites with a strong overall link profile consistently rank faster than those with weak ones. This article is a documented summary of their findings. 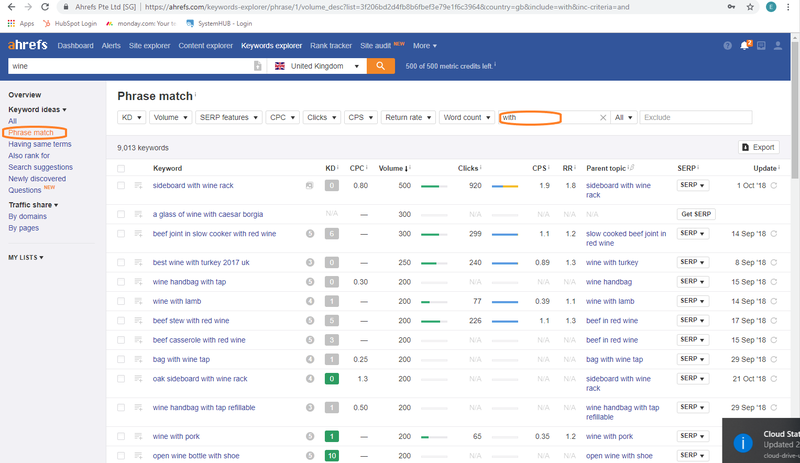 It references the ahrefs tool, but similar results can be obtained from other search tools such as SEMrush or MOZ. How old are the top ranking pages? 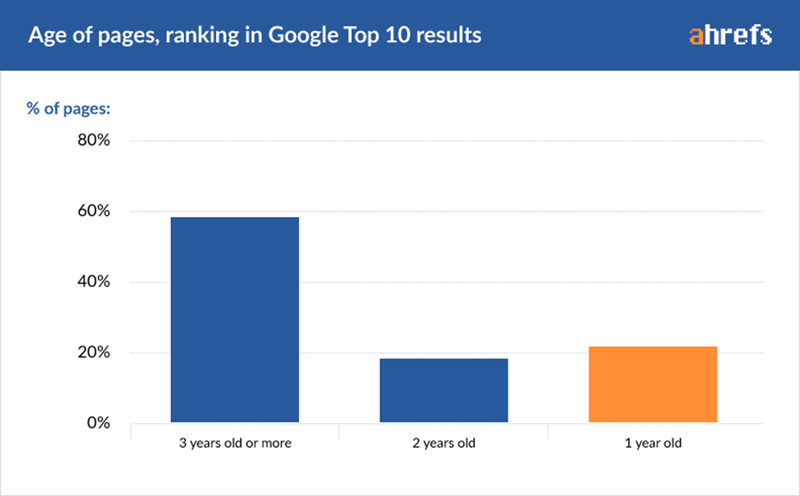 First off, Ahrefs tried to find out how old the current top-ranking pages on Google are. 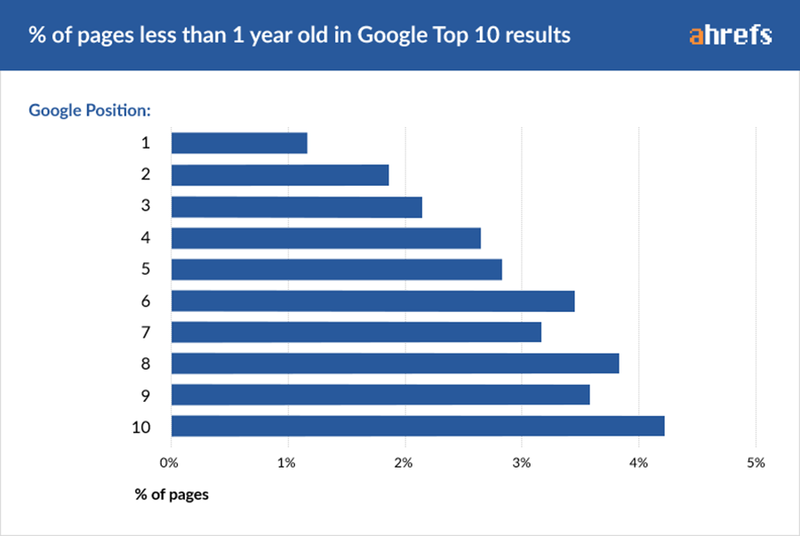 The graph shows that the average Top 10 ranking page is older than two years. And those ranking at position #1 are (on average) almost three years old. The Search Engine Results Pages are evidently dominated by "old" pages. To answer this question, Ahrefs randomly selected 2 million pages that were first seen by an Ahrefs crawler one year ago. They then tracked the position history of each page for any keyword it’s ranked for. 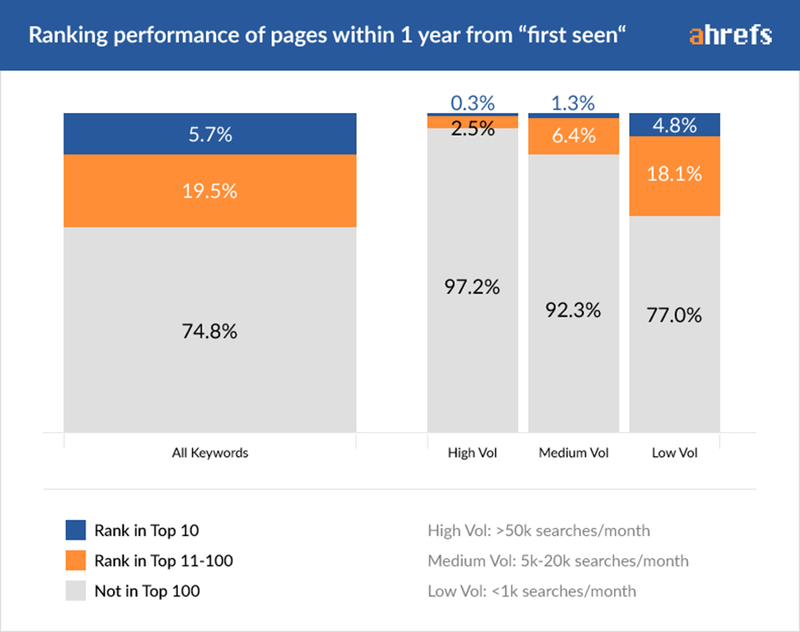 Only 5.7% of all studied pages ranked in the Top 10 search results within 1 year for at least 1 keyword. 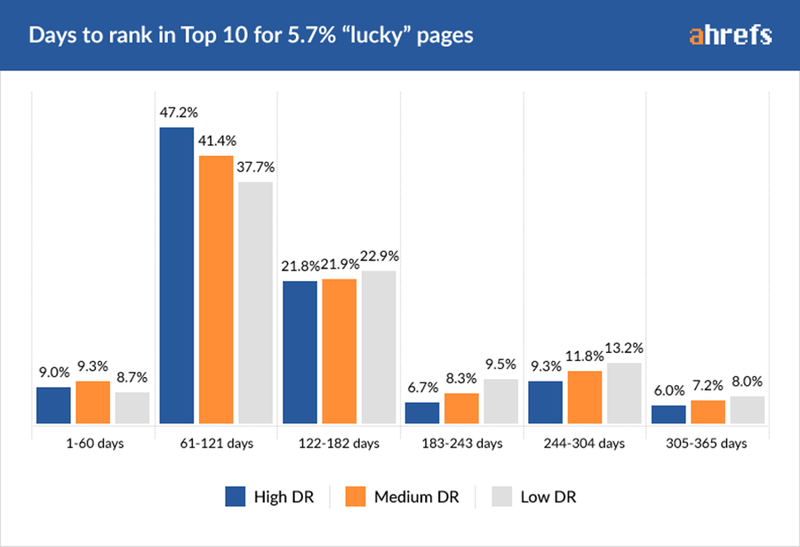 As already mentioned above, pages from websites with a high Domain Rating (DR) performed way better than those with a low DR.
Ahrefs then zoomed into the 5.7% of “lucky” pages to see how quickly they got to the Top 10. It is important to keep in mind, that the results in the graph above are only those describing the "lucky" 5.7% and that the remaining 94.3% did not achieve the same results and rankings in that time-frame. 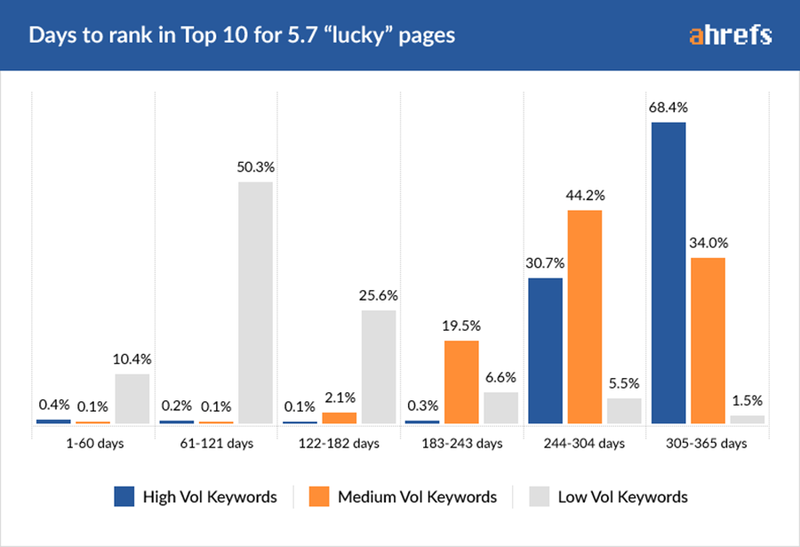 Only 0.3% of pages ranked in the Top 10 for a high‐volume keyword in less than a year. Clearly, you can rank for low‐volume keywords in a very short time, while the high‐volume ones take almost a year to get into the Top 10. But again, don’t forget that this data only applies to 5.7% of “lucky” pages that ranked in the Top 10 within a year. The vast majority of pages don’t perform that well. 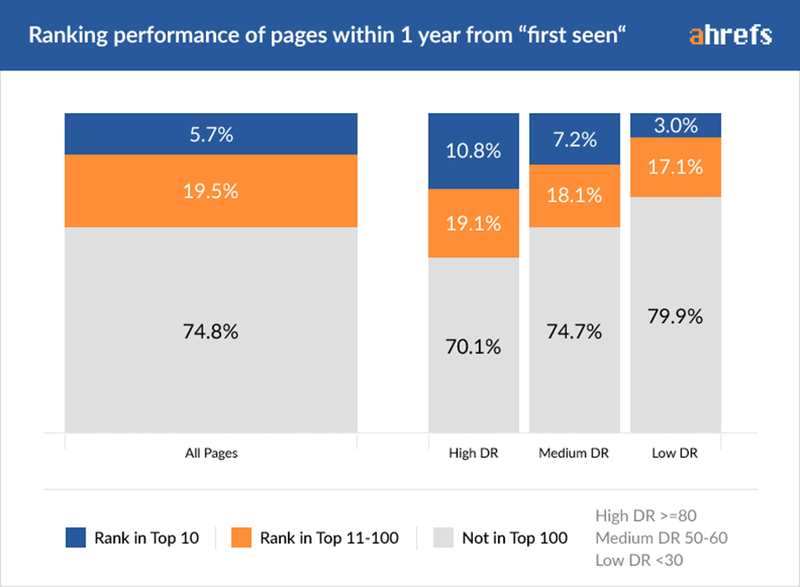 Most new pages do not get into the Top 10 Rankings within the first year and (especially depending on the topic) it usually takes time and patience for a page to rank very highly. Working with a website that does not have a strong backlink profile, you first have to create content targeting keyword topics with low competition and low search volume, building links to the website's homepage and creating topic clusters, in order to build the website's backlink profile. Next, go to the Phrase Match report tab and add your modifier keyword in the "include" search box, now you can see a list of low competition keywords (which you can see by looking at the Keyword Difficulty rating) with a decent Search Volume. 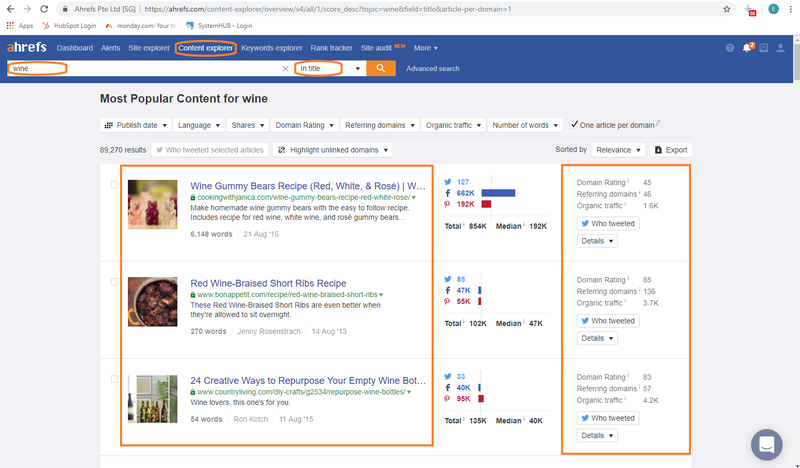 In order to further narrow down your search for a low competition topic ,you can go to the Questions report to find something to write about. In order to make sure that you have chosen a worthwhile topic to cover, you should work with this three-step assessment checklist. 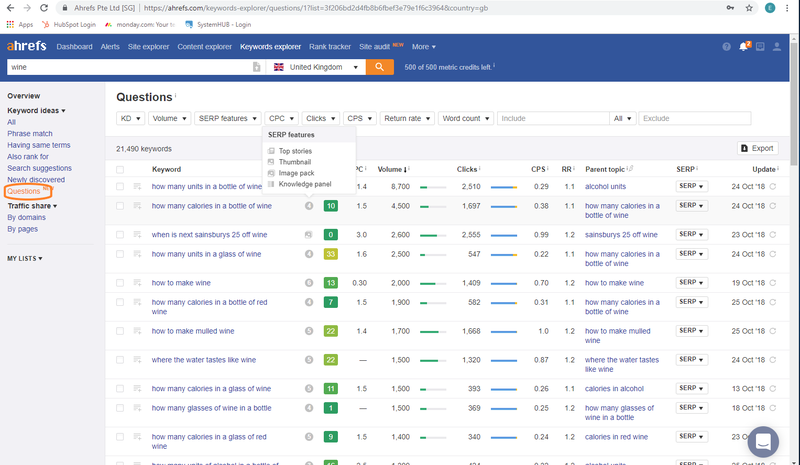 You can cover the checklist by analysing the top 10 SERP's of your topic, finding out what format searchers are interested in, how much traffic they generate, how many keywords they rank for and the overall strength of the websites you are competing against. 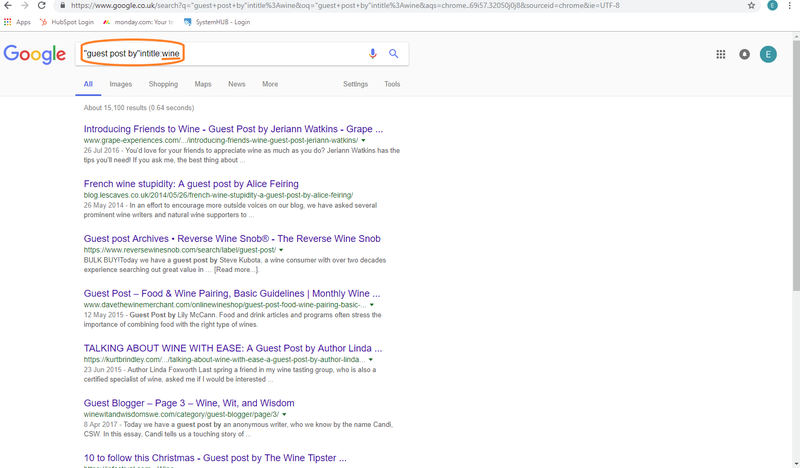 First off, you have to find websites to pitch, which you can do by going to Google and searching for "guest post by"intitle:your topic . In order to make an educated decision you have to choose an SEO metric to be able to recognise high-quality websites. 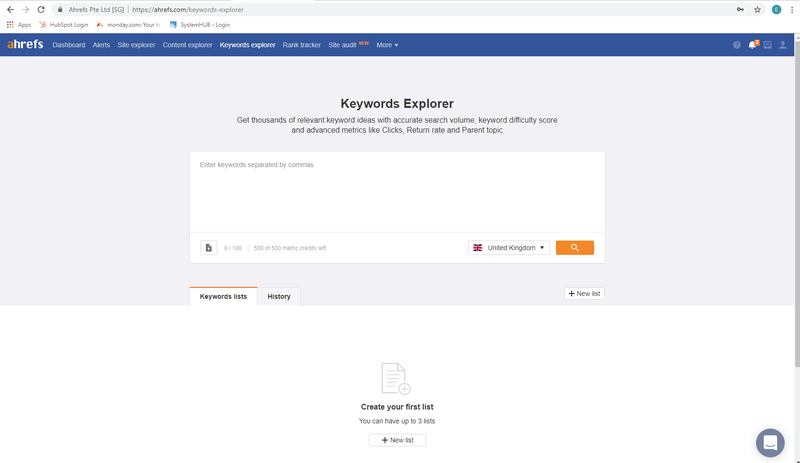 You can use Ahrefs' SEO toolbar to do this, looking at each website's DR and their overall domain's Search Traffic (ST). 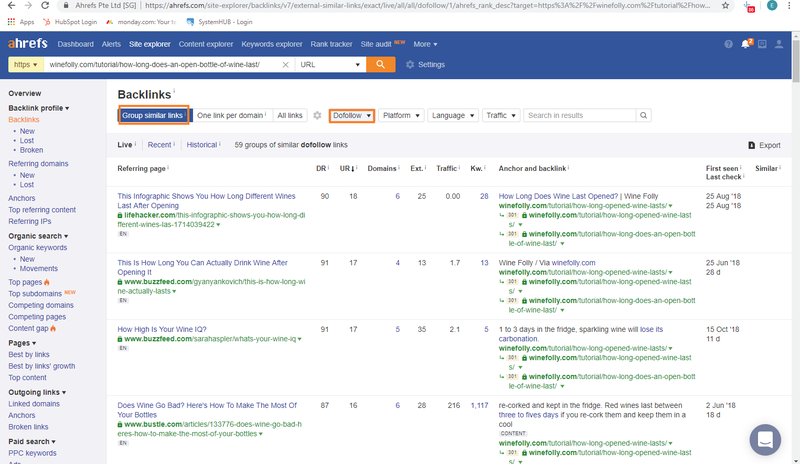 You can also use Ahrefs' Content Explorer to do this much faster and easier. 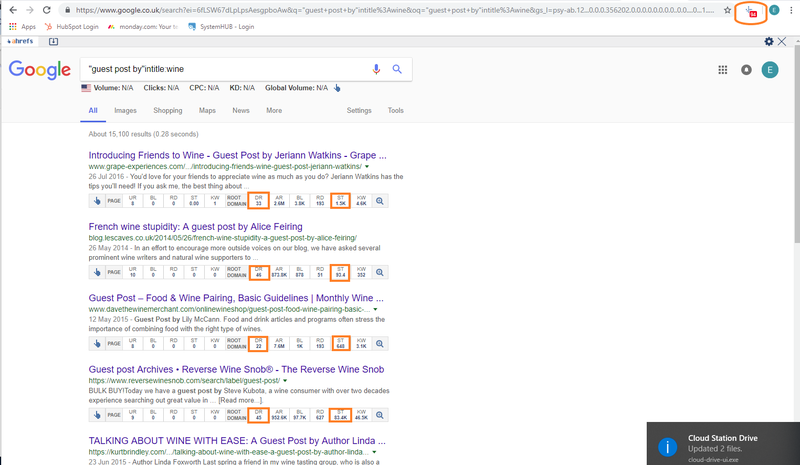 Just type in your topic and set it as "in title" search, in order to avoid a website appearing more than once and being repetitive, use the "one article per domain" filter. 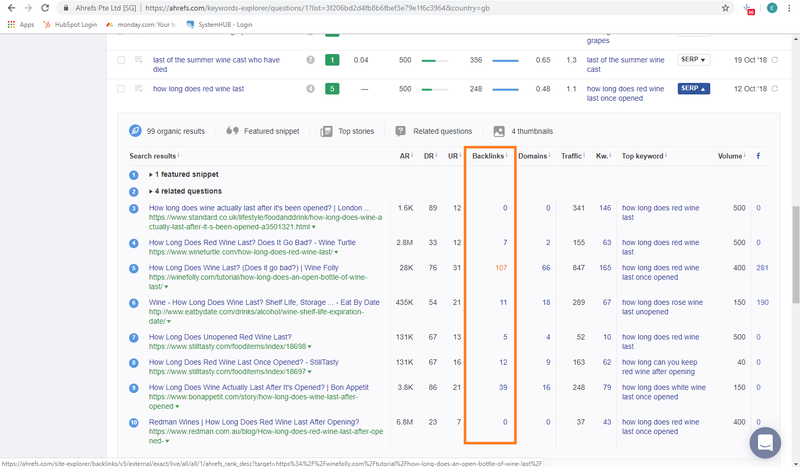 Now you can see various websites reporting on your topic and look at their SEO metrics at the same time. Finally, you can pitch an article that might interest them (due to your topic) and later link it back to your own website and article. HARO connects journalists with sources on specific topics. Once you sign up, you will receive e-mails with lists of questions that journalists need help/answers on and specific topics they need more (professional) information on. You can respond to a specific question or supply them with information on a topic you may have a lot of knowledge on and in return they will link back to your site ,in order to give you credit. Open up the backlink profiles from all the top 10 pages on your topic and pick the best places to get links from. First off, "group similar links" in order to exclude duplicates. Next, set the link type filter to "dofollow", so only value-passing links will be shown to you. Now you can look through the different results and pages shown to you and reach out to other blogs to gain high-quality editorial links. If you follow all these tips and strategies you will become more competitive and be able to rank higher with your posts and with your website!